Bring water and a pinch of salt to a boil. Add corn and boil for 3-4 minutes. Drain well. In a bowl, add corn plus all the ingredients except oil and water. Sprinkle water in batches until you get a thick clumpy batter. You want the batter to coat the corn pieces well and stick to it. In a pot, heat oil for frying at medium heat. Once hot, drop the corn pieces in one by one. Fry until golden brown. 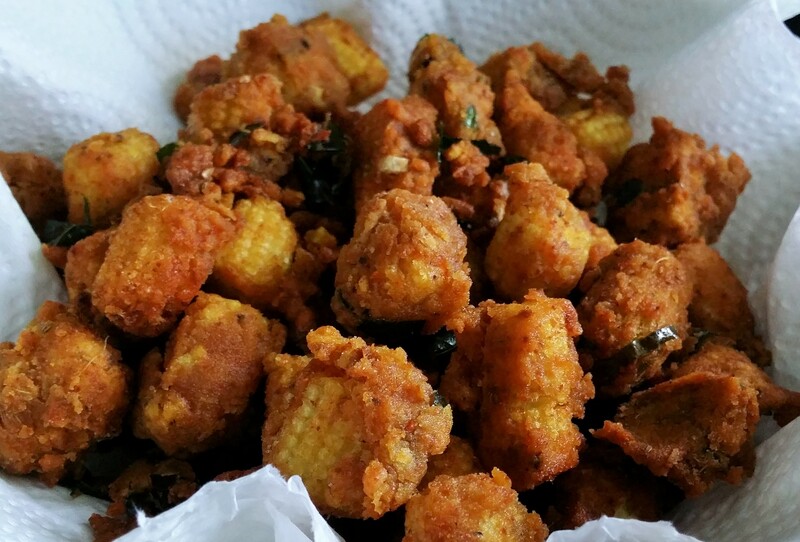 If you like the fritters very crispy, increase the flame to a high heat and continue frying for another minute. Scoop out and drain on kitchen paper towels. Serve hot with chai. Great on a rainy day. Enjoy!